International Economics publishes top-quality, original research in applied international economics. Topics covered include trade, trade policy, macroeconomics and finance. A section is devoted to "Data, Tools, and Replication". Submission options include "Fast track" and "Transfer" from top journals. International Economics, is devoted to the publication of research in the area of applied international economics. The journal especially welcomes empirical contributions that include, but are not limited to, topics in international trade, commercial policy, open economy macroeconomics, international finance, exchange rates, financial and monetary policies, economic development, migration and factor movements. 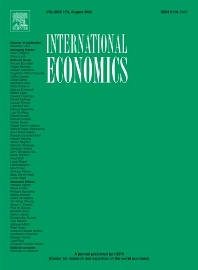 The journal also has a "Data, Tools, and Replication" section that is devoted to the publication of short notes presenting new and innovative datasets in the area of international economics, new tools useful for research in international economics, and/or replications of existing empirical studies in the field of international economics. For more details about the "Data, Tools and Replication" section, please see the file DataToolsReplication.pdf. The current turnaround time to a first decision is 39 days, with an approximate acceptance rate of 12%. To avoid unnecessary delay for authors, the editor might decide to return the paper to the author(s) before full review if she/ he determines that the paper is not suitable for the journal. The decision is always motivated. The journal also offers authors the possibility of choosing a "Fast Track" option. Under this option, there will be no revision, i.e., the decision is either a rejection or to basically publish the paper as is (with possibly minor changes asking for some clarifications). When choosing the "Fast Track" option a decision will be made within 6 weeks. To utilize the "Fast Track", please accompany the submission by a cover letter specifying explicitly that you chose this channel. International Economics also offers a transfer option for papers which were marginally rejected from top field or general purpose journals. Authors could require the editors of International Economics to consider reports and editorial decisions taken within the last six months from such journals. The submission should then be accompanied by (i) a cover letter indicating that the paper is submitted through the informal cascading option, (ii) the previous referee reports and (iii) a document describing how the authors have incorporated the comments of the referees and editors of the journal which earlier rejected the paper. International Economics encourages young researchers to submit their work. The journal will also organize special issues to emphasize new research directions. The journal is indexed by EconLit, RePEc and Scopus.